Please could you introduce yourself in 5 or 6 lines. Born in a small town in Indiana, I was always a geek interested in games, electronics, and digital circuitry long before home computers. I left high school able to program mainframe computers in three languages, and had learned electronic circuit design. I attended DeVry University – one of the only purely engineering-centric schools available at the time – and worked in one of the integrated circuit design labs at National Semiconductor. I left National to work at Atari before Nolan Bushnell left the company, and then spun out of Atari to found Activision in 1979. What did you want to do when you was at school for a career, and what was your first job? My first love was electronics, and I wanted to make gadgets that could be sold on late-night TV by pitchmen like Ron Popeil. I had designed a number of marketable products while still in college, but I came to learn that I needed more hands-on training in electronics to supplement my book learning. I took a job at National Semiconductor to complete my education in the real world. I had designed a Tic-Tac-Toe playing machine in college as project leader of a 6-man team for class credit. I was very comfortable designing digital circuits. So I went to work for National Semiconductor in the Linear IC department. My friends thought I was nuts, knowing that I was all about digital electronics before then. But I saw it as the best way to expand my grasp of all things electronic – sort of like throwing a kid into the pool to teach him to swim (although I’m not sure that works). After about 2 years I had learned all I expected to get out of that job, and instead had introduced the use of microprocessors and digital electronics to the group. By the time the Atari opportunity came along I was ready to move on. As a Boy Scout in the late 1960s, my Scoutmaster worked in data processing at a local company that had a shiny new IBM computer system. At the same time, the Boy Scouts created a Computer Programming Merit Badge. Due to this connection I was one of the first to complete that new merit badge, and I received an introduction to computers at a time when they were almost mythical systems to the general public. What was your first computer, and is that your favorite computer and why? I designed a number of computing devices with some of the earliest microprocessors. I couldn’t afford to buy even the earliest machines – such as the IMSAI 8080 or the Altair 8800 – so I built my own. The first fully-featured computer that I built was based on National Semiconductor’s SC/MP microprocessor (pronounced Scamp). But my favorite microprocessor by far has always been the 6502. The 6502 was the processor in Atari’s game systems and their home computers; as well as other machines like Apple’s first computers and the Nintendo NES. The 6502 was lightning-fast, performing a simple set of instructions in just 2 or 3 machine cycles unlike its contemporary 8080 and Z80 which could take 3 times as long. (In a way, the 6502 was the first RISC processor.) Speed of execution is essential to video game programming, so it was perfect for making games. In your opinion, what is the best console of all time and computers, before the year 2000? The Atari 2600 was my favorite, and it was far more successful than its designers expected. In that era a game console was expected to last for a couple of years – the 2600 exceeded 10 years at the top. The NES stole Atari’s thunder, and it was tailored for making certain kinds of games, such as games with tile-based backgrounds like Super Mario. But of Nintendo’s machines I would have to say I preferred the SNES. Their use of the 65816 microprocessor offered the benefit of the best parts of the 6502 coupled with a 16-bit instruction set. Was this the computer that you first programmed on? I cut my teeth typing programs onto punch cards and submitting batch jobs to an IBM 360 thanks to a timeshare agreement that a local bank had with my high school. After that I programmed many microprocessors and ultimately a couple dozen game consoles and systems. Programming is just a tool to make an electronic system perform. I used whatever computer system I had access to. When did you realize you wanted to get into game industry, and how did it happen? Alan Miller and I were tournament tennis doubles partners, and we both lived in the same apartment complex in Sunnyvale, CA. One Sunday night after a practice session he asked me to proofread an ad that he had written (to hire video game programmers for Atari where he worked) before he sent it in to the San Jose newspaper. I thought it might be an interesting job. That night I went in to my lab at National where I had one of my custom computer systems, where I used that computer to write up a resume on a word processing program of my own design. I interviewed at Atari at 10:00 AM the next morning and got an offer by 2:00 PM. I gave my notice at National less than 24 hours after reading the ad. Given that my goal had always been to make products that could be sold on TV by the millions, it was a good fit. Yourself, Alan Miller, Robert Whitehead, Larry Kaplan, and former record industry executive Jim Levy founded Activision how did this all come about? The culture at Atari was deteriorating. Nolan Bushnell had been ousted by the corporate giant Warner Communications, and it was no longer a fun place to work. At the same time, we four game designers were making $60 million for Atari and drawing salaries around $20,000 per year. Atari was also adamant that we were mere cogs in the corporate machine, and not contributing creatively to the products. Meeting with an attorney to discuss the proper way to go about starting a company, we were introduced to the attorney’s personal friend, Jim Levy. Jim’s background made him a perfect fit. We founded Activision with an eye toward crediting the game designer in a way similar to that of the author of any other creative work. Starting our own company let us create the kind of working environment that made us want to come in to work each day. And it allowed us to participate financially if the work that we did was well received by our customers. What was the amount of money invested in Activision at the beginning? Activision was one of the first investments by a Silicon Valley venture capital firm in a software business. The VCs were used to investing in companies that made semiconductors or electronic equipment, but with a software publisher the primary asset is the authors of the software, and those assets walk out the door every night. That makes it a risky investment. Sutter Hill Ventures (and partner Bill Draper) took a chance on Activision, but we had to give them a very sweet deal. There was a combination of credit and equity totaling less than $1 million, but as Activision repaid the credit the VCs ended up owning roughly two thirds of a $300 million company for $150,000 dollars. Due in part to Activision’s proven success, later companies in the video game business were able to give up far less of the company and raise millions of dollars. What was your first project when Activision was formed? I was the lead engineer in the early days of Activision. My first project was to create custom microprocessor equipment that made it possible for us to make games. These “development systems” were essential – no games could be made without them. We were also on a shoestring budget, and rather than buying an EPROM programmer I built a homemade unit for programming all of our prototype cartridges as well as for sending final game code to manufacturing. I created the printed circuit board layout for our first development cartridges and later modified it to fit our cartridge plastic when it was made. After completing all of the hardware projects, I could then start writing games. 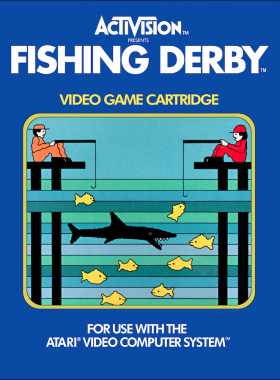 With our first CES trade show looming at the beginning of January, I designed and programmed Dragster and Fishing Derby between October of 1979 and the end of that year. None of us got much sleep for those 3 months. Was there a good team at Activision and did your work well together? Are you in touch with any of the team still? At Activision we designed games in an open lab, with cubicles that opened toward each other in a central bullpen. We did this because we found that we all worked together very well, contributing ideas and gameplay experience to each other’s projects. We called this the “Design Center” concept, and because it worked so well we repeated it in small design studios across the country. I am told that the Harvard Business School did a case study on this way to design creative products, and I run into other game studios that follow the practice to this day. The original Activision game design team has scattered, but I still run into members of the group from time to time. 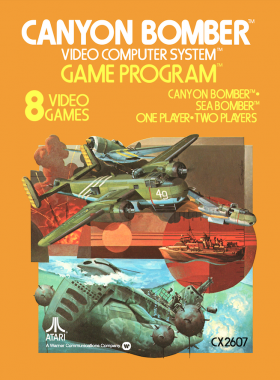 What was the first game you programmed at Activision? Which tool did you use to develop it, and what issues did you have? 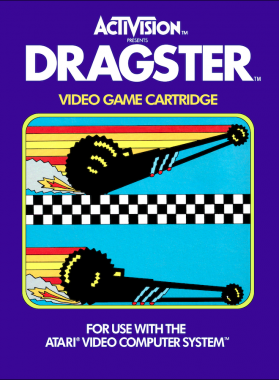 My first Activision game was Dragster, and it used the Atari 2600 hardware in ways that the system’s designers never intended. Rather than making a game with 2 small 8-bit sprites (like tanks) shooting at each other, the drag racer was 48 bits wide and moved smoothly across the screen from left to right. I have met game designers who came after the release of Dragster who, rather than trying to figure out the exotic techniques I used, admitted to dumping and disassembling the Dragster ROM – taking the display technique directly from the Activision game to add to their game code. Was Outlaw the first game you ever programmed, please describe the experience? When I arrived at Atari for my first day, I was handed a programming manual for the Atari 2600 and told to “have at it.” Fortunately I didn’t have to build the development systems, they already had those. But I had to figure out how the hardware worked and then figure out how to make a game with it. I settled on a gunfighter game inspired by an arcade game I had played before. I’ll admit that my game code was pretty rough on the first project, but I got better at it over time. Pitfall! was a great game how did you come up with the idea was it a collaborative effort by your team and was a lot inspired by Indiana Jones? Pitfall grew out of my desire to make the main character of a game be a human avatar. 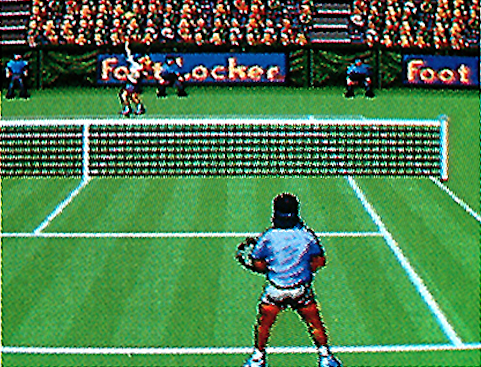 At the time the main character of a game was typically an inanimate object like a tank or jet plane. 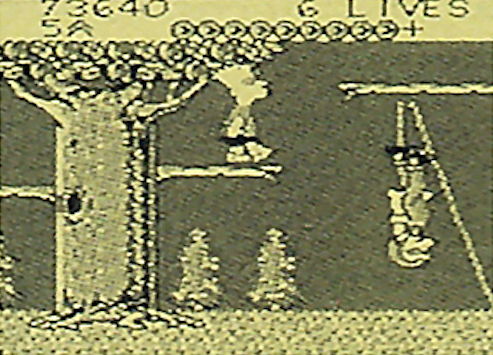 I struggled to make Pitfall Harry look reasonably human within the limitation of 8 pixels of width. Once I had the character, it was logical to run, jump, and climb around the world. I decided that if he ran off the right edge of the screen he would come on to the left side of the next screen in the world. The fact that it was in the jungle was certainly inspired by Indiana Jones. But the real strength of the concept was that the game was not limited to a single screen. When you ran off one screen and on to another, that new screen could theoretically be anywhere in the world. 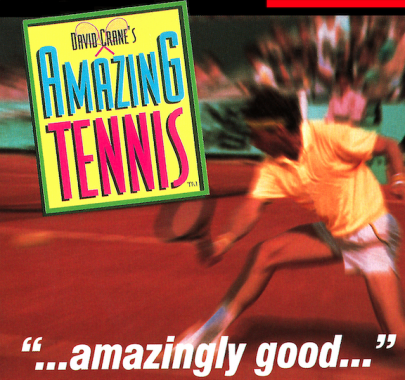 That idea inspired hundreds of games in the “platform” genre because of its versatility. Pitfall! Maintained the top slot on the Billboard charts for 64 weeks and was named video game of the year in 1982? Did you think Pitfall! Would be such a Massive hit please enlighten us how the idea come together and a bit about the development side? How many copies sold worldwide? I had no doubt that Pitfall represented a revolution in game play. Finally, the game world was only limited by the designer’s imagination (and the size of the ROM). That said, the core game design only took about 10 minutes to develop. After that it was a task of about 1000 hours to produce. Pitfall sold some 4.5 million units on the Atari 2600, and its ports and sequels sold millions more. How was the relationship with Atari at the Time. 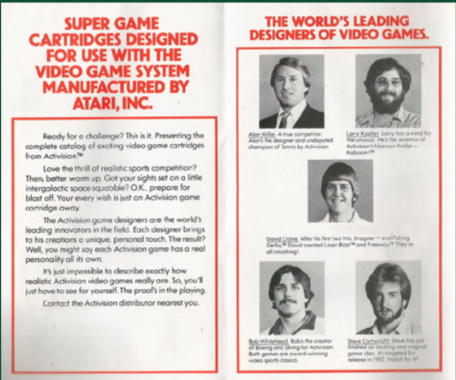 Did Activision pay a fee to Atari to produce on their machine? What was the cost a cartridge at the time (Cartridges, Boxes, manuals)? Atari tried to sue Activision out of business. We did nothing wrong, however, and so they failed. It is a good thing for the game business that they failed. Activision was the first third-party publisher of video game cartridges. At the time Atari was the only supplier of games for their console; Mattel was the only supplier of games for their console (the Intellivision). Activision made games for every console. Pitfall II: Lost Caverns was also the number one rated game in the country for over six months and won the 1984 Golden Floppy award for best game and the Video Adventure Game of the Year award for 1984 was you surprised the sequel was also so successful? Pitfall II was a better game than Pitfall. It is also often pointed to as the first successful video game sequel. But more important, there are a number of innovations in the game. Pitfall II had the first “way points” in a game. If you died in the game you would return, not to the beginning but to the last safe point you touched. 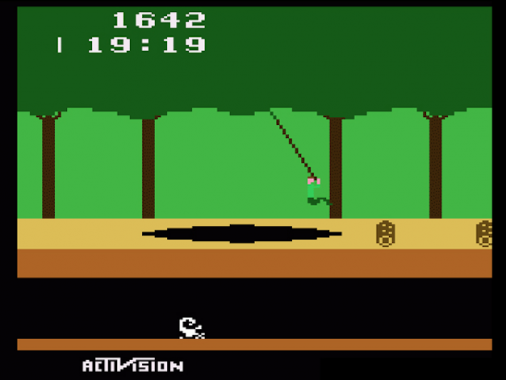 Pitfall II was also the first game to convey emotion with background music. Where Pitfall was primarily a linear game, Pitfall II added vertical exploration. To the basic skills of running, jumping, and climbing were added swimming and flying (via helium balloon). 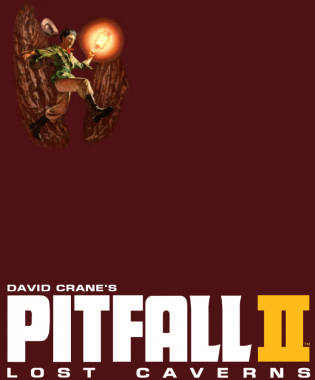 The truth is, I didn’t design Pitfall II as a sequel (which normally means milking a property’s success). I designed Pitfall II because there was so much more I could do in Pitfall Harry’s world. I think I would have been surprised if it was not received well. Little Computer People can be described as the “mother” of The Sims. How did you come up with this idea who developed this game with you and was it as fun to make as it was too play? 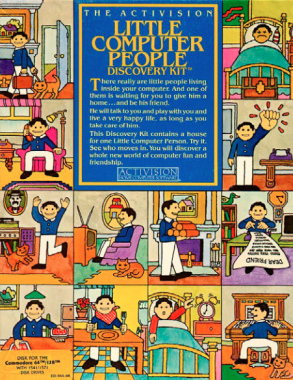 Little Computer People began as a marketing gimmick called “Pet Person”. A creative guy from outside the game industry, Rich Gold (who has since passed), thought of the concept as a modern Pet Rock. He raised some money and got some early prototyping work done (including a high quality code base written by Wickstead Design Associates in New Jersey) before eventually bringing the concept to Activision. The problem with making a game following the model of the Pet Rock is this: The Pet Rock took a product that had zero cost (a rock) which was made valuable through a clever marketing story. A video game costs hundreds of thousands of dollars to create, and it has to be much more compelling that a cute story line about making something into a pet. By the time Rich approached Activision, the product was already encumbered with a very high cost. The chance of turning it into a commercially successful product was slim. But I was intrigued and convinced Activision to spend hundreds of thousands of dollars to acquire the concept, in spite of the fact that the product would be in the hole financially before I put a single hour of work into it. I then spent the better part of a year making it into the interactive simulation that finally made it to market. We had great plans for follow-up products, but the product never recouped its costs. A video game publisher can’t make products that lose money and continue to stay in business. I wish it were not the case, but between the acquisition cost and my time it simply cost too much to make. Do you consider LCP as an IA ? There was a great deal of AI in Little Computer People. The fun part was in giving the LCP a personality, and allowing him to have moods. And when he was in a mood not to interact, there was no way to tell how much of what you typed was understood by the Sim. As a result, people gave the LCP much more credit for intelligence than he really had – sort of like we do with cats. It was so easy to believe that he understood everything but simply chose to ignore you. What was hidden behind the upstair’s doors in LCP ? I never saw him go in there. I always assumed it was his attic, and I wondered what code scraps he might be saving up there, but I never found out. One funny technical detail on the Commodore 64 was that the C64 couldn’t access the floppy disk without turning off the display sprites. The LCP game was designed to auto-save progress on the floppy disk, and he had to disappear to do that. So his bladder was tied to his need to save. You might have noticed that whenever he left the screen, either into the bathroom or out the front door, the disk drive cycled – saving his game state. So when the code decided that he had gone too long without a save, he took a bathroom break. A rumor says that you directly programs in Binary (010110001), is it true? If not, do you know where this rumor comes from? It is somewhat true. In my 40 year career I have programmed in two-dozen different programming languages, including various assembly languages and more traditional high-level languages. But my favorite remains the 6502. Even after decades I can still recognize the binary opcodes of a 6502 program at a glance. Assembly language programs also use ASCII encoding to represent text, and I can translate most ASCI-encoded strings from their binary (actually hexadecimal to be accurate) patterns. Ghostbusters was a massive hit and one of personal favorite’s how did this movie franchise come about and did you work with any of the movie team during development? Movie studios pitch their up and coming films to video game publishers. And video game publishers have staff to search for licenses that make sense. Our people met with their people and we were given a script. I should point out, however, that this practice is much more common today than it was in the early 1980s. 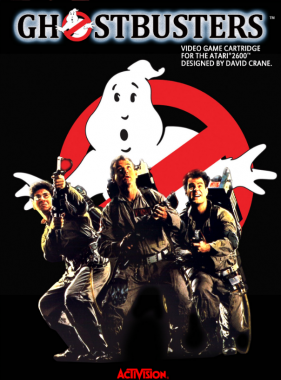 Ghostbusters is considered to be the first successful case of a movie turned into a video game. Before our success there were other attempts, including some notable failures such as E.T., but no big successes. We read the Ghostbusters script and loved it. But we were very late in the process. The movie would be out in a few short months, and we needed a year to make a great game. If the movie was only a moderate success, it would be a waste of our time if we couldn’t get the game out shortly after the film hit theaters. I volunteered to make a game in time for the movie’s theatrical release. I noted that the only way to make the deadline was to re-task a game I was about halfway done with. I was working on a game with a working title of “Car Wars” with an in-game economy that allowed buying weapons and equipment, placing these purchases on the car, and driving around town. I changed the weapons into traps and ghost vacuums, ghosts set off alarms in the city, and the characters became the guys with “unlicensed nuclear accelerators” on their backs. This wasn’t so much a case of making a Ghostbusters game, but making a fun game that was set in the Ghostbusters universe. And no, none of the actors or film crew were involved in any way. What was the budget to create Ghostbusters? The development was done with on-board staff. So the ‘budget’ was my time for 6 months, talented – and one of the first ever – game artist Hilary Mills, and Russell Lieblich doing music. Other programmers got involved at some point to provide sound drivers, title page coding, etc. What formats did you develop Ghostbusters on please enlighten us the easiest to develop on and the most difficult and why? As the creator of original video game designs, I always created the first version of a game on whichever game system was popular at the time. I designed and programmed Ghostbusters on the Commodore 64. Most of my games were then ported to other game systems, and those ports didn’t need my involvement. Porting a game to a different platform was purely a programming task – no new design was necessary. My time was better spent creating a new game property. In a career spanning 4 decades, making games practically every day, I saw the introduction of new consoles every couple of years. In order to remain current I had to learn every new console or game system as it came out – some 25 in all. So it is a little difficult to single any one out as either the easiest or most difficult. Every system had its strengths and weaknesses and I just tried to use the former to overcome the latter. 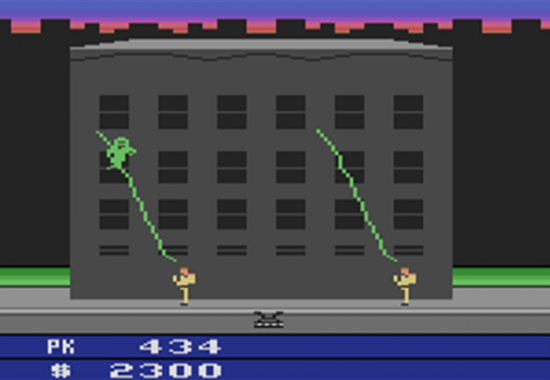 Activision had many hits such as Pitfall 1 & 2 and Little Computer People. What was your favorite to work on? I have published nearly 100 games. Every one of them consumed me for some period of time. So I have always treated the game I was working on at the time as my “favorite.” Otherwise I would not have been able to expend the effort each required. I imagine that is not the answer you were looking for, but I have made so many games that every time I try to count them I miss a few. And as others have said, they are all my babies. When you developed for the Atari what tools did you use to develop these games? Atari had some small PDP-11 minicomputers about the size of a microwave oven. (I would have said breadbox, but who remembers how big those were?) They also had a development system that plugged into the Atari 2600 cartridge slot to simulate the cartridge. Those two pieces of shared equipment provided most of the tools needed to make games. Shared computer time was scarce so we printed out a listing of our program every step of the way and ‘debugged’ by mentally simulating program flow and ‘editing’ by scribbling on the listing with pen or pencil. For really tough debugging problems they had a few very expensive HP logic analyzers. Every project had to be hooked up to the logic analyzer at one time or another. What are you currently doing for a living? Please enlighten us. I do a range of consulting. 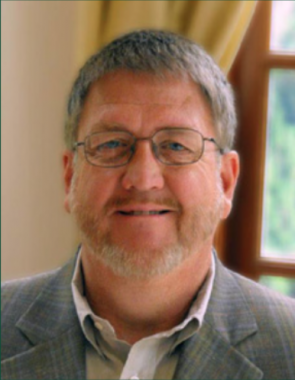 I work as an expert witness, providing the courts with my 4 decades of experience in video games, typically working to analyze the technologies and claims made in US Patents. I occasionally dabble in game design, usually helping out friends rather than trying to either raise money or self publish. And I am available to speak at gaming conferences, both modern and retro. In addition to speaking, I support the efforts of historians and preservationists. I think it is important that we remember the roots of the video game business to help avoid making some of the same mistakes. How did the Pitfall TV Series come about? 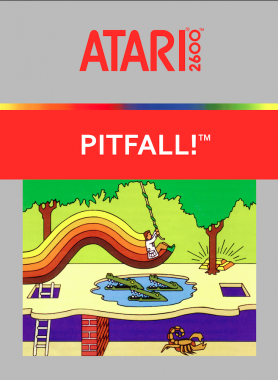 The Pitfall TV series was another cross licensing deal, and another first for Pitfall. The game Pitfall became a TV series, and showed up in toy stores as a board game, multiple physical puzzles, and other licensed products. The TV series was developed in between Pitfall and Pitfall II, and I created an arrangement of the theme song written for the TV show and used it as the game play music in Pitfall II (also composing the minor key version that plays during Pitfall Harry’s ‘death’). What is your best-selling game? Of all of the games I have published on all of the game systems, everybody remembers Pitfall because just about everybody either had one as a kid or knew someone who did. That’s OK… in a survey a while back one of the trade magazines listed the top 100 games of all time. Pitfall was still on the list at #99, after as many as a million games had been created. Good for you, Pitfall Harry! What is in your opinion the differences between a Japanese game and a Western one? There are some cultural differences that can be seen in animation, for example. Comparing Bugs Bunny to Anime illustrates some of them. But in the history of video games, the style of Japanese games was driven by the display hardware of the NES. The NES featured a tile-based game background renderer. This allowed for a large number of different game screens, but at the expense of making every screen look very much alike. You can see this in Super Mario – every screen is made up of small square blocks. I personally preferred more realistic game backgrounds, even when designing a game for the NES. 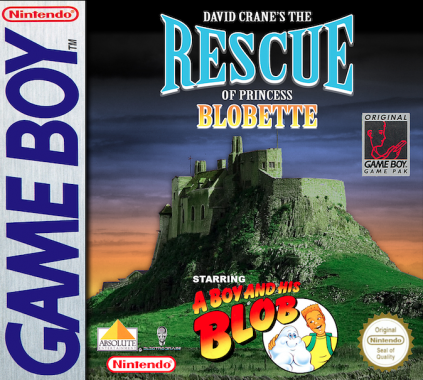 We went to extra effort to make the game screens of A Boy and His Blob, for example, to look realistic and not blocky. It was a conscious choice. Was it a cultural difference? Maybe… maybe not. But on this side of the ocean we had slightly different goals driving the look of a game. Where the concept of A boy and his Bob come from? And what was the difficulties you encountered by making it? I had played other tool-using games, but I never liked having to break up the game flow while bringing up a tool menu, so I decided to make the shape-shifting Blob become your toolbox. 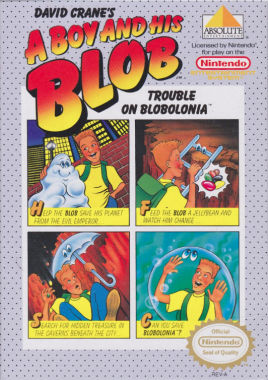 I prototyped the Boy, the Blob, and the ladder transformation and showed it to Garry Kitchen (with whom I ended up collaborating on the game) and he loved the idea. The most difficult part of the project was the schedule. We had just gotten a license to make NES games, and wanted to put our best foot forward. We designed a game that should have taken 8 to 9 months to create, and started it 6 weeks before Nintendo’s submission date. We made the deadline by going weeks with little or no sleep, but it almost did us in. Did you take part of the remake launched by Wayforward in 2009 for the Wii? At the time that WayForward licensed the concept, the property had been purchased by another company. I almost got involved in a remake a couple of years before that, but I was not involved in the Wii game. How did you managed to make three Simpsons games the same year (1991)? Absolute Entertainment, and its subsidiary Imagineering developed a number of the Simpsons titles for Acclaim. I was primarily making original titles for Absolute at the time, but I helped out by making a level or two in some of those games to help out. I don’t take credit for the games overall, although I am credited as having worked on them. 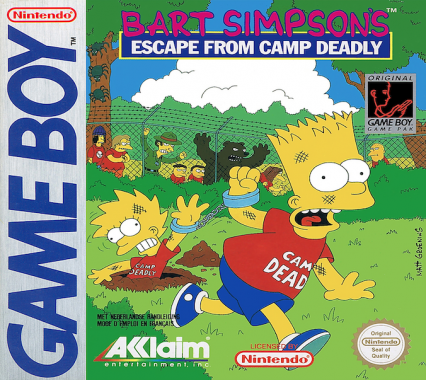 That said, the Game Boy game “Escape from Camp Deadly” was mostly my design (although a programming collaboration). I was quite proud of the twitch game play in the Food Fight level of that game. The Simpsons games were difficult and their quality lower that your previous games. Is there any reason for that? Whether a game is considered “difficult” is a matter of taste. I have had many people tell me that Pitfall was too hard, but millions of people would disagree. I think the Simpsons titles were good designs, and they were well received by the market. What is the game, you are the most proud of and why? Every game that I did throughout my career had something in it that I was proud of. Dragster and Grand Prix were two of the more technically intense. 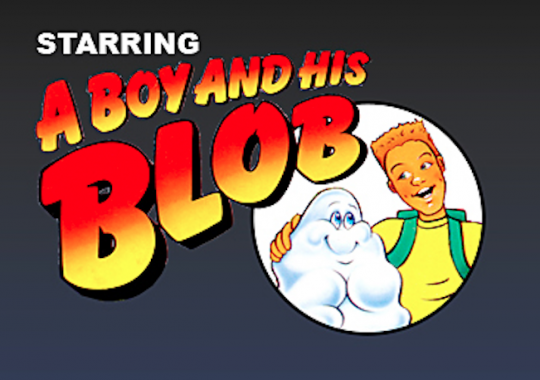 A Boy and His Blob was the most creative. The ability to put two chickens side-by-side in Freeway was considered an impossible task. Pitfall’s world was defined mathematically, making over 200 screens possible. I designed a patented integrated circuit that went into the Pitfall II cartridge that gave the Atari 2600 expanded rendering ability and three-part harmonic music. Around the same time I created a very elegant bank-selection circuit that would have allowed our games to expand seamlessly to 32K bytes (if the 2600 had lasted just a couple more years). If you flipped the C64 Transformers disk over it played a fully narrated slide show telling the Transformers origin story. I had to create custom software in both the C64 and the 1541 disk drive for that. The Ghostbusters title page was described by one journalist as the most enjoyable single scene ever in a video game. I guess my point is that in those days we were innovating every day, and it is hard to single out any one game or feature as the one that I am most proud of. What is, in terms of budget, the most expensive game you worked for? I have worked on one-man projects, and projects with a large team of programmers, artists, and others. Most of my games were made using company employees – not on contract, so the budget wasn’t all that clear. So I don’t really know. One fun anecdotal story revolves around the ‘budget’ for Pitfall. I created the design, drew every pixel of art, created the sound effects, and wrote every line of the program. I figured that I spent 1000 hours making the game. When all was said and done, Activision made about $50 million in wholesale revenues from the sale of Pitfall. So I earned for the company around $50,000 per hour of work. Sadly, I wasn’t paid that much. What is the game or concept, you regrets not having had? I made a number of games over the years that were never good enough to sell. I put everything into the game that I could think of (at least to the extent that the primitive game console allowed), but they were never released. So it is not so much that I had game concepts that I regretted not having. It was more a desire never to release a game that wasn’t fun. What is your best and worst memories in the industry? What are your highest regret of this time? I enjoy some modern games but feel more love for the smaller teams of the past, I feel the fun factor has gone in modern games and are more like movie productions; games can be bug ridden now as patches can be made. In the past we didn’t have updates and in-app purchases. What is your view of our industry? The game industry is broken. My advice to game players everywhere is that if you like high quality games made by professional game creators, be prepared to pay a fair price for them. Otherwise, you may soon have trouble finding any fun games to enjoy. Thank you for your time it has been a pleasure and honour.